I grew up in a non-denominational church, so I don’t think there was ever much of an emphasis on Lent in any of the churches I attended. I had plenty of Catholic and Episcopalian friends growing up though, so I never not knew what Lent was. As the Lenten season approached, it was always a topic of conversation as they tried to figure out what to give up. Although I understand the concept of sacrifice in the context of Lent, to be honest, from my non-denominational viewpoint, it always just seemed a little weird to have to give something up to show your allegiance to Christ. Especially when my friends were giving up things like chewing gum, Slurpees, or shopping at the mall. I couldn’t quite figure out how not picking up a Slurpee at 7-11 on the way home from school for some 40-odd days would make their relationship with Jesus any more intimate. Or how does one prove gum is an idol and Jesus is your true god by relinquishing Doublemint? And exactly to whom does one prove it? God? Yourself? Your friends and family? In case you think that by now, I’m harping on anyone out there observing this season leading up to the Easter holiday celebrating Christ’s resurrection through the fasting of something that has a stronghold in your life, well, unequivocally, I’m not. In fact, several years ago, in our church, my circle of friends, etc… (still in a somewhat non-denominational church, by the way) it became, while I don’t want to say fashionable, recognizing and participating in the Lenten season became a kind of exercise in understanding that we are all powerless and weak in the face of sin in our hearts. Taking part in Lent and denying oneself of that which is a barrier to a deeper relationship with Christ made sense. I knew there were things – so many things! – that kept me from knowing Him fully. Like tally-marks on a chalkboard, I could add up all the dark places in my heart that were keeping me from Him. So I vowed that even if I couldn’t get rid of them altogether in my life, at the very least I could pinpoint my weaknesses and be conscious as I worked to eliminate them as barriers to a God-centered life. Weakness # 1 – Dove dark chocolates. I like sweets, especially if I’m in Cincinnati and there’s a Graeter’s ice cream store just down the road. But I don’t have to have dessert every night, and a bag of Oreos doesn’t hold the same charm that it might for others. 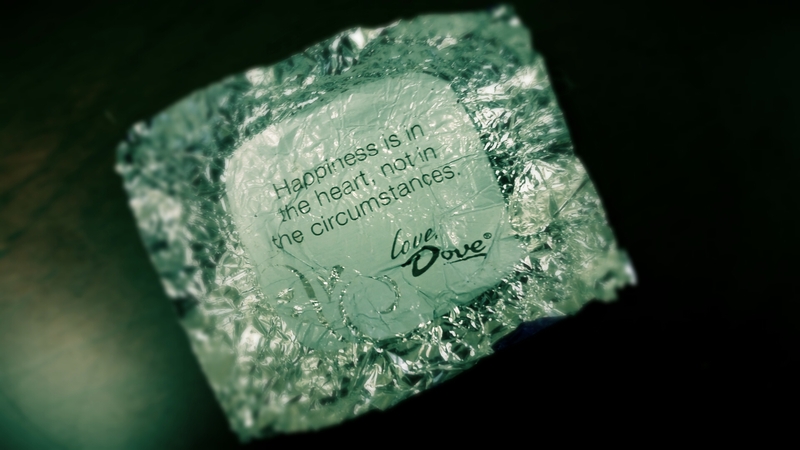 Dove dark chocolates, on the other hand… well, we have a relationship. They soothe me when I’m stressed. 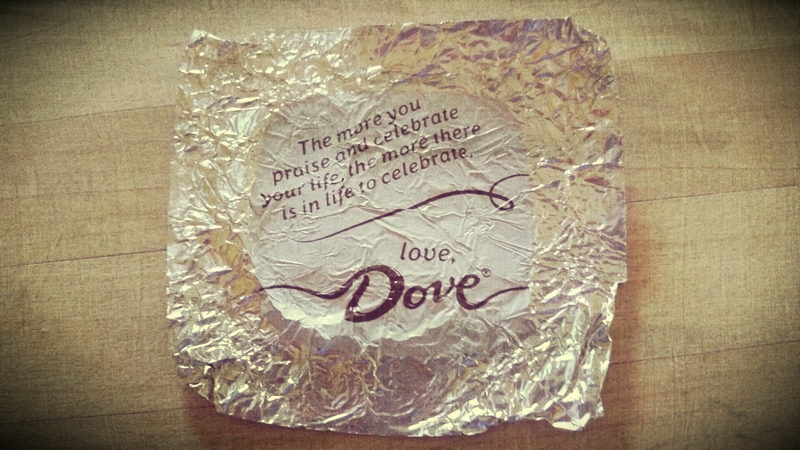 Beyond the chocolate itself, each wrapper shares sweet words of encouragement – literally- with me. But give them up, I did. (Rereading this, it sounds as if Yoda is writing this instead of me…) It was hard, but I did it. Weakness # 2 – reading the news on the internet in the mornings. We aren’t able to get home delivery of an actual newspaper, so it became my practice to read the news in the morning after my devotions. Somehow though, the time I spent reading about the national debt, global warming or mid-term elections kept me from getting my kids’ school ready, taking care of the animals or throwing dinner in the crockpot So I gave it up for forty days of Lent. Weakness # 3 – lists. I love lists. I makes lists of lists. Lists make my days flow in an orderly fashion. If I get off track, my list is always there to get me back on the right set of rails. Yet lists can become – for me – something I rigidly stick to, allowing little room for flexibility. So to give up lists… well… that’s hard. Forty days of scattered thoughts and tasks. Hard. There were others, but in short, I discovered that I was weak. Sinful. That I needed Him to help me overcome my tendencies toward making gods out of chocolate and news and lists. I learned that it’s all too easy to make a seemingly innocuous habit into something that can become more important in our lives than it really should be. Except… at some point, to expose my sinful nature for forty days only seemed almost sinful in itself. What about the other 325 days? Was it really drawing me closer to Christ to stop reading news for forty days, if, the minute Lent was over, I was once again typing Drudge Report into the address bar on my computer? And even though I didn’t really want any chocolate for weeks after, did it stop me from eating it? No. I was already starting to wonder if just forty days really mattered, when I came across this article about reading the Bible in a year. Reading through the Bible in a year is something I’ve done for many, many years, but that article kind of flipped my thinking about devotions, Bible reading, and even Lent on its head. Get up. Read the day’s portion of the Bible. Check the little box that says “it’s done.” Read my devotions. Pray. Feel good about myself because I’m consistently in the Word. Warm fuzzies and props for me!!! And the same goes for Lent: Give up __________ for a whole forty days. Marvel at my discipline and how I’ve unearthed my sins and weaknesses. Do you see what’s happening? In my desire to draw closer to Jesus, I was still making it all about me! Not Him… me. Which completely defeats the purpose of reading the Bible or taking part in Lent. So wrong on so many levels…. Time out here:you should know that this is my journey, and something God revealed to me about me. If you feel strongly that you need to fast for Lent, that’s awesome! I mean it; I do. It’s just that God was showing me that my tendency is toward works, like Martha’s was too. He was – and is – showing me that I need more Mary in my life, more faith. But I don’t think God intends for me to live by works, and works alone. Yes, I do have faith, and a great deal of it, at that, for the most part. But sadly, that’s not always my default. Works, on the other hand, is. That’s why, this year, my observance of Lent is a little different from years’ past. In a way, I’m not giving anything up these forty days. On the other hand, I still am trying to shed some strongholds in my life. Sometimes, I get so wrapped up in what seems like the right thing to do that I don’t do the right thing by God’s standards. Above all, I want to be living according to His will, not mine. Beautiful thoughts, Christine! I don’t have time to read all your posts (or anyone else’s), but when I do, I’m blessed. Thank you for blessing me with your kind words. I completely understand – I wish I had time to read every blog post by every blogger I read too! Nancy, thank you for taking the time to share your comments; I’m glad to know there’s a God-loving, Graeter’s-loving, dark chocolate-loving Martha-ish twin out there somewhere! 😉 And I think I read on your blog somewhere that you visited a childhood home in Columbus? I did the same thing in Columbus not too long ago… And from what I’ve read so far, I’ve been impressed with your Biblical knowledge and how best to align our lives in His will; you have a gift for explanation, most definitely!